Does your child have a tongue-tie? 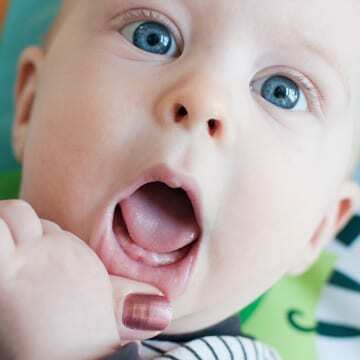 If so, this frenum restricts the range of motion in the tongue, which can affect nutrition, speech development and even the growth of your child’s face and jaws. There is a school of thought that a tongue-tie will go away on its own but, in reality, this is the worst decision you can make. Left untreated, a tongue-tie can impact your oral health and overall health throughout your life. Your local Santa Cruz oral health professionals at Ebrahimian Integrative Dentistry want to educate you on the potential risks of leaving a tongue-tie untreated. Infants: The most significant ramifications of a tongue-tie in infants have to do with breastfeeding. Possible consequences include failure to thrive, difficulty latching, a diminished bond between baby and mothers as well as a negative effect on the milk supply of the nursing mother. Children: Left untreated, as a person with a tongue-tie enters childhood, problems chewing and swallowing are common—as are difficulties with the development of speech or abnormal growth of the jaw. Many children with tongue-ties have problems chewing and swallowing age-appropriate solid foods. Self-confidence may deteriorate due to the ongoing speech issues. Dental hygiene problems or dental issues also may manifest as consequences of the tongue-tie. By this age, living with a tongue-tie usually starts to lead to the formation of negative oral habits that develop as compensation for the limited range of motion in the tongue. These negative habits usually form unconsciously. Adolescence and adulthood: The effects of a tongue-tie become more significant the older a person gets. Adults who have lived with a tongue-tie for their entire life are hindered by the poor habits that formed because of the poor mobility of the tongue. These issues may include speech impediments, poor nutrition, strange eating habits, clicking or popping sounds in the jaws, jaw pain, migraines, or the protrusion of the lower jaw. Speech problems manifesting from a tongue-tie may lead to serious self-esteem issues that can affect a person both in professional and social situations. Elderly individuals with a tongue-tie may find it difficult to keep a denture in place in their mouths. Your best defense against a tongue-tie is to have this tethered oral tissue identified as soon as possible and then treated by having a frenectomy performed to release the tie and restore full range of motion in the tongue. If negative habits have developed in compensation because of living with the tongue-tie, your Los Gatos dentists, Drs. Max and Ariana Ebrahimian, also may prescribe stretching exercises or a course of myofunctional therapy to help restore balance to the orofacial system. Our staff includes Jean Shimuzu, a licensed myofunctional therapist in Scotts Valley. We possess the experience and training to diagnose and treat tongue-ties in patients of any age. If you or a member of your family has any type of tethered oral tissue, schedule an appointment with our team of experts today by calling (831) 438-4411. Ebrahimian Integrative Dentistry is proud to serve patients located in the California communities of Los Gatos, Santa Cruz, and Scotts Valley.